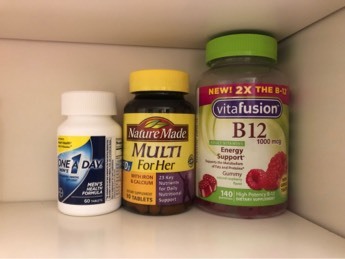 These are the vitamins in my medicine cabinet at home. I take the Multi For Her and the B12. Kevin takes the One A Day for Men, and the B12. I've been taking a multi-vitamin for years now. We just recently started taking B12, so far I cannot tell a difference in any effects it might have. In fact, I feel less energy lately so I don't know what that's about. The older I get, the more important these things are to me. Our four year old Hadley takes a vitamin daily too, they make it so fun for kids. She has been picking out Disney Princess gummies, and Anna and Elsa gummies. Kids think they are eating candy since it tastes pretty good, which is awesome for getting kids to take vitamins. Does anyone take Elderberry? I have these in my Amazon cart right now, but my question is how many different vitamins can you take all at the same time? Does one have different effects if taken with another? I guess that's a question for the doctor, or my BFF Google. What vitamins do you take everyday?